Tommy Bender was the Redmen football coach from 1943 through 1949. His teams compiled a 35-23-4 record, with his first squad going 8-0 and winning the Buckeye League championship. Bender's stint as Athletic director followed, from 1949 through 1966. Bender also worked as a football official at the high school and college levels. The Fostoria Athletic Boosters annually present an award named for Bender to an outstanding male athlete at FHS, with criteria based on attitude and comportment as well as athletic achievement. Brad Fisher was an All-Ohio football selection as a senior in 1977. He went on to play at Clemson University, where he was a starter on the offensive line in his junior and senior years. After playing left guard as a junior, Fisher moved to left tackle as a senior and helped the Tigers to a 12-0 record, including a victory in the Orange Bowl that brought the team the national championship. Carlos Jackson starred in football, basketball and track at FHS. He was named first-team All-Buckeye Conference and honorable mention All-Ohio in 1948. He went on to play football at Bowling Green State University, where he was the team's leading rusher in 1955. He missed the 1956 season after contracting polio, but he returned to limited action in 1957. Jackson taught and coached at FHS before going back to Bowling Green as an assistant football coach. He died of a heart attack at age 44 in 1974. He has also been inducted into the BGSU Hall of Fame. John Tinsman was Fostoria Community Schools' trainer from the time he arrived as a teacher and trainer in 1962 until his retirement as trainer in 1997. Tinsman was one of Ohio's first certified athletic trainers at the high school level, and he was inducted into the Ohio Athletic Trainers Association Hall of Fame in May 1992. He also coached football and wrestling. Fred Wilch was 23 years old when he was named head boys basketball coach in 1957, and his teams would win five Great Lakes League titles and several sectional championships during his 20 years in the position. Wilch's 1963-64 team went 19-2. Wilch's career record was 231-170. He also taught, worked as head golf coach and assisted in football at FHS, in addition officiating high school football. 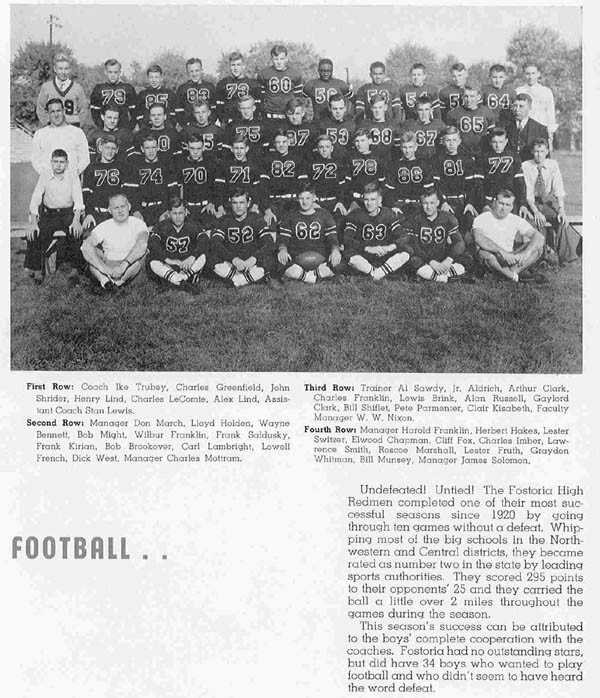 Fostoria High School 1938 football team was one of two undefeated FHS squads between 1922 and 1991. The 1938 Redmen, coached by Dwight W. "Ike" Trubey and captained by Bill Munsey, posted a 10-0 record while outscoring its opponents 295-25 with six shutouts. Ohio not yet having divisional classifications or playoffs, Fostoria was ranked second in the state behind Massillon. Team Lettermen were; Bill Munsey--Lawrence Smith--Ed Kuhn--Wilbur Franklin--Lloyd Holden--Roscoe Marshall--Graydon Whitman--Howard Aldrich--Floyd Parmenter--Charles LeComte--Henry Lind--John Shrider--William Shiflet and Charles Smith. Juniors were; Cliffore Fox--Charles Imber--Clair Kisabeth--Gaylord Clark and Allen Russel. Plus Sophomore Alex Lind.